Me? A little fragranced candle crazy? No way.. Or yes way? I discovered the joy of the scented candle and now there's no turning back - I have them in every room of my apartment. That obsessed. I went Christmas shopping to a local British store (that's how much I miss the UK sometimes) and they always have a good stock of seasonal Yankee candles. Next to Bath & Body Works, Yankee Candle is definitely my favourite candle brand. I don't always have the funds to buy full sized candles so I often buy these smaller ones - I otherwise might go broke. So that's what I did when I just couldn't choose.. I'm currently burning Fireside Treats and I love it! It's a very warm and inviting scent, but not too overpowering. My favourite out of the bunch is definitely Honey Glow - it smells SO good! I also have Honey & Spice (bought it in medium & large jars already), but this one is even better I reckon.. Even though these 'sampler' sizes are small, they have a great scent throw and burn up to 15 hours if used correctly. 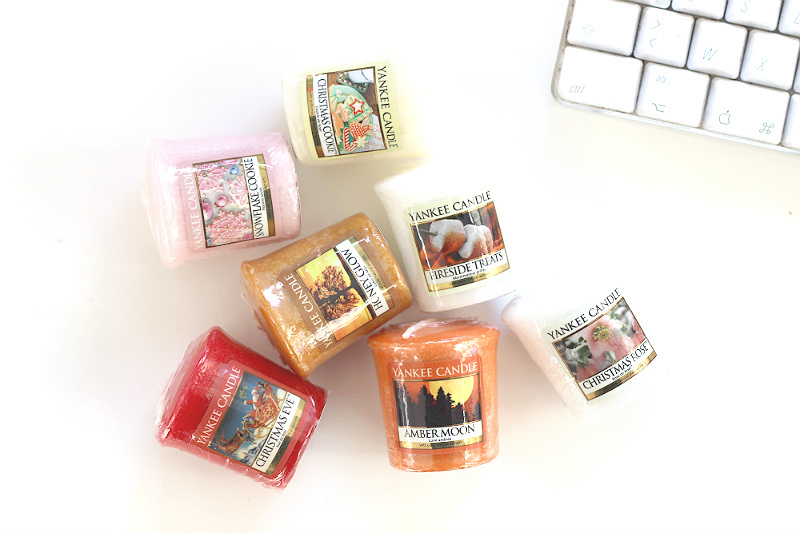 I paid €2,15 for each at Stonemanor British Store in Everberg, and in the UK these Sampler Yankee Candle should retail for £1,80. Can't wait to try more Christmas scents!